Charles J. O'Brien III of Georgia won the AMERICOVER Grand Award and a Gold for his exhibit "Georgia Bicentennial". The exhibit also won the APS Award of Excellence for Pre-1940 Material and the United States Stamp Society Statue of Freedom Award. 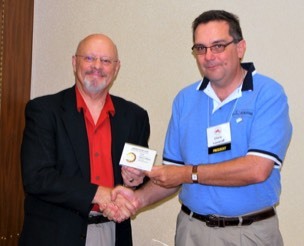 As the AMERICOVER Grand Award, he will be eligible to participate in the 2010 Champion of Champions competition at APS STAMPSHOW 2010 in Richmond, VA.
O'Brien also won the AFDCS Richard Thompson Reserve Grand Award and a Gold for "New York World's Fair 1939". 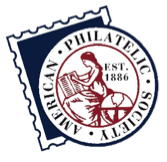 The exhibit also won the American Philatelic Congress Award for Excellence in Writing. Download complete palmares. LEFT: The biggest applause during the exhibit awards presentation was for Alexandra Fillion. 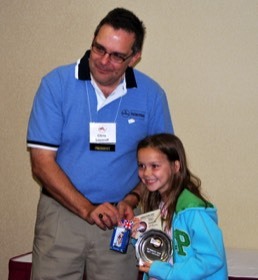 Alexandra, age 8, not only won several youth awards, but she won the AAPE Creativity Award (which is not specifically for a junior exhibitor). 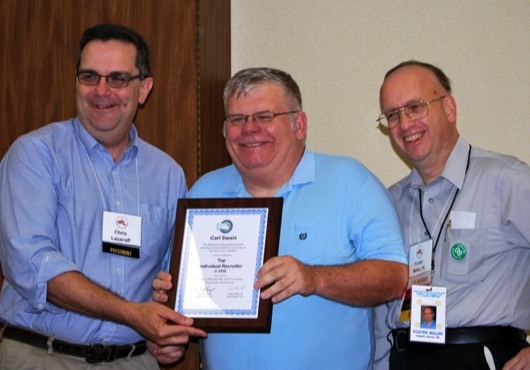 BELOW: Carl Swain (center) receives his award for Top AFDCS Recruiter of 2008 from President Lazaroff and Membership Director Foster Miller. The Cachetmakers' Bourse was (as always) very busy. 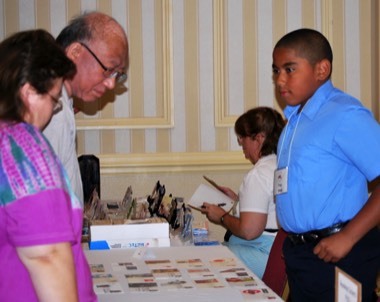 At right, young cachetmaker Troy Shah meets with prospective customers. 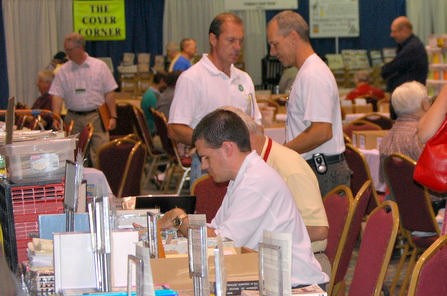 The dealer bourse bustled with activity for three days. Bourse hours were extended on Friday due to heavy buyer traffic on the floor. 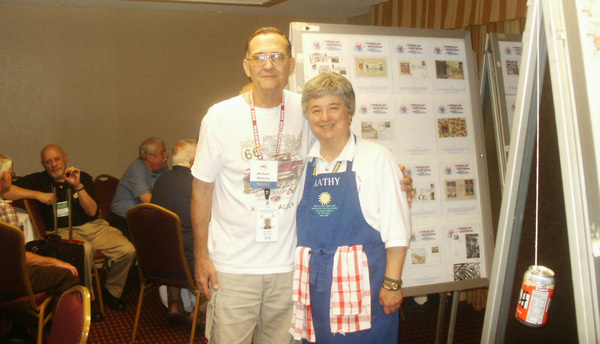 The hospitality suite sponsored by the Robert C. Graebner Chapter and the Claude C. Ries Chapter was a popular meeting place. In the foreground are Ries Chapter hosts Michael Moticha and Kathy Clements. Not all the fun took place at the show hotel. 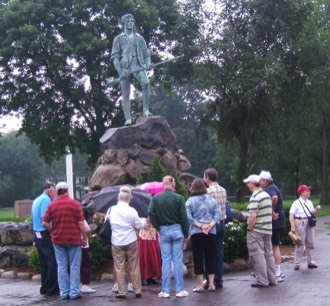 Here a group of AFDCSers check out the Minuteman statue across from The Battle Green in Lexington, site of the opening shots of the American Revolution in 1775. After the close of the show, a group of 28 journeyed to the Bull Run Tavern (built in 1740) in Shirley, MA for an evening of good food and entertainment. 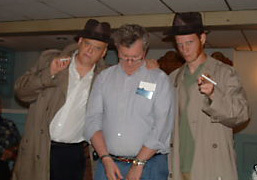 Before, during and after a dinner the group was entertained by three members of Brickroad Productions (plus AFDCS members) as we solved the mystery of who killed the president of a firm that was going to produce a line of ceramic plates imprinted with the AFDCS logo. The culprit was none other than AFDCS Board Chairman "Floyd" de Vries!